Jackman 2009 ATV season coming soon! Kevin, owner of Maxx-s ATV Rentals in town, went out to explore the ATV trails last weekend to assess what needs to be done for the season. He said they are looking to be in great shape so far and if spring is not too wet, they should be good to go by Memorial weekend. ANother thought to consider that even if the trail system in the region is not open yet, you could contact a land management company here in town and get a permit to ride. There are some great fishing spots out there! Of course, there is always things to do to get the trails ready so if you are interested in helping the club prepare for the summer 2009 season, contact Maxx-s ATV Rentals or the Border Riders Club. So get out your ATV and give us a call to reserve your cabin this summer. Do a little riding then take a swim in the lake then sit by a campfire and enjoy your family and friends 😀 Now that sounds fun! Below are 2 shots from our webcam taken this morning. The first is from 8AM and as you can see, there is a lot of open water but also, a lot of ice along this side of the shore. My understanding is “Ice Out” is when you can get from point A to point B so where are these points? The wind kicked up so as you can see in the second 10AM shot, very little ice can be seen. Now it is after noon and I only see some “crushed ice” along our shore so I can honestly say that the Ice Out Date is today, April 26th. Visit our website webcam to see it for yourself. I will call Allen in the morning to confirm the official date. Sorry, no winners this year although Celie was the closest…she thought April 28th. I took this shot this morning so you can see the Ice Out progress on Wood Pond. It is a beautiful morning today and as you can see, the lake is opening up. There is still plenty of ice on the lake though so for those of you who entered the Ice Out contest, do not give up hope yet. There was a HUGE moose in front of Indio ❗ He (she) was so big that I could see his head atop the deck rails…he walked over to the drive of Cabin 2 then paused. I quietly went in the house to grab the camera but as I started back out, he turned and walked toward Cabin 1. I again, trying to be quiet, walked over to Indio and he (she was nowhere to be seen 🙁 but I could hear him (her) walking in the woods of my neighbor. To hear them call out there when the lake is still white with ice, it simply seems impossible. But I guess the only need enough open water to land. 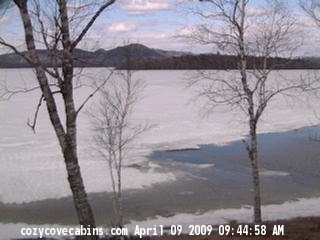 For those of you entering your opinion on “Ice Out” this year, don-t forget to watch our webcam. I saved this shot from 10am on the 9th. It was a beautiful day as it is today. Steve and I went to Augusta this weekend to help the chamber booth at the Maine Sportsman Show. What a great turnout it was. Lots of things to see and learn. If you have never been, try to go next year. Then as we started coming up 201, it changed. Maybe it was around Johnson Mountain, after the Forks, even though it was still raining and dreary, somehow it did not seems depressing. Still a little snow in the woods as we drove and there was more green to see as there are more Pine trees up this way. 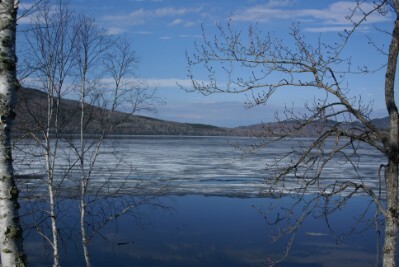 Then as we pulled in our driveway-GOD IT IS GOOD TO BE HOME- we saw the white birch trees, still saw piles of snow and the lake, still frozen, was still white. Maybe that whiteness from the frozen lake reflects the sky differently because even though it was drizzling a little overcast, it was bright and cheery. The ice on the shoreline had a pretty pale blue tone to it. NOTE: it rained last night so that pretty blue tone is gone as the shoreline now has a bit of muddy appearance thins morning. Water is rising! Maybe the only reason I saw the beauty as we got closer to Jackman is that it was just good to be home but I think that even though Mud season is never really fun, it seems to be more tolerable up her because there is more color. It is that time again. Mud season has begun. Our driveway is almost void of ice and snow. Which means, it is time for the Ice out on Big Wood contest here at Cozy Cove Cabins. Last year it went out on May 3rd. As the snow is melting, the ice is rising (I assume that is what is happening) as I can see different colors along the shoreline. We are still having very cold nights but the days are in the 40s on average and the sun has been shining bright. Add a comment to this post with your guess as to the date the ice will go out. We can only accept one date per person and do not guess the same date that is already posted so you do not have to share the prize. The exact date will be what the Town of Jackman records as the ice out date for 2009. Whomever chooses that date, will win 50% off one night when they stay with us 2 or more days this summer. Please Note: Only one discountpermitted per stay at Cozy Cove Cabins. You must submit your date before April 21st to be eligible. I am making the deadline earlier this year as I am predicting that it may be around the end of April this year.